How Do I Schedule a LASIK Evaluation? If you are interested in getting LASIK surgery you will first need to find out if you are qualified for the procedure. A basic LASIK evaluation will help your doctor determine if you are a good candidate and will help you to better understand the potential benefits and risks of the surgery. 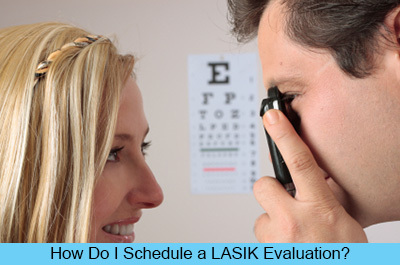 Scheduling a LASIK evaluation is easy. Simply contact your potential LASIK provider and ask to schedule a consultation. Some people choose to talk with their regular eye doctor before scheduling an initial evaluation to ask questions and determine if they might be eligible for LASIK. You can talk with your eye doctor at your regular eye exam if you are curious if LASIK might be an option for you and they can recommend a surgeon to you. What Type of Exam Will I Need? If you are considering LASIK surgery you will need a comprehensive eye exam. This exam will help your doctor to determine if you are a good candidate for the procedure. It is very important to be open and honest with your doctor during your eye exam. While some medical conditions or medications may make LASIK surgery not advisable, it is still best to be honest to maximize LASIK outcome and minimize the risk of long term complications. During your initial evaluation your doctor will measure your eyes using special tools. Contact lenses can change the shape of your eye, sometimes for weeks after your last use, and should be avoided for several days to weeks before your initial appointment. If you wear contacts talk with your doctor and ask how far in advance they should be removed. During the weeks before your appointment wear glasses exclusively. What medications (including over the counter medications) are you currently taking? Do you have any eye conditions or diseases? Has your vision prescription recently changed? What are your expectations for LASIK eye surgery? An important part of your initial consultation is learning about the risks and benefits of LASIK surgery. This is an excellent time to ask any questions you might have and to resolve any concerns. Before your appointment you may want to create a list of questions to ask your doctor. As you discuss the procedure make sure you are comfortable. Don’t hesitate to ask questions or to ask for additional information. Your doctor may be able to provide additional reading materials or resources to help you learn about LASIK. If you need more time before scheduling surgery, don’t be afraid to ask. Take as much time as you need to evaluate your options, weigh the benefits and find the right solution for you. In addition to talking about the risks and benefits of LASIK your doctor will also educate you about the proper preparation and after care for your LASIK surgery. Good preparation before your surgery and care afterwards will help make your surgery more successful and will reduce the risk of negative side effects and problems. It is generally recommended that you avoid using lotions, creams, makeup and perfume before surgery since these can increase your risk of infection. You will also want to avoid wearing contact lenses for several weeks before surgery. After your procedure you will need someone to drive you home. You may have blurry vision after surgery and won’t be able to drive immediately after surgery. Special care will be needed during the first days to avoid injuring your eye. Avoid rubbing your eyes since this can lead to displacing the flam and damaging the cornea. You should also avoid all sports for a few days, contact sports for at least a month and swimming for at least two months. You will need to wear an eye shield at night for several weeks. Some discomfort is common after surgery and your doctor will help understand when to be concerned. In general discomfort will begin to fade quickly after treatment and most people feel better just a few hours or a few days after surgery. Getting ready for LASIK surgery can be stressful, but one of your best resources is your initial LASIK exam. Take advantage of this time by ensuring that you understand the procedure and are ready to have surgery. Scheduling your exam might be as easy as picking up the phone and making call, but before you go in you should prepare by researching, writing down questions and evaluating your medical history so you’ll be ready when the time comes. Am I a Candidate for LASIK Surgery? How Long Will My LASIK Results Last? What conditions of the eye can be corrected with LASIK surgery? What is the success rate of LASIK surgery? Is there any pain during LASIK surgery?